One goes up, one goes... - "A Single Word ... "
One goes up, one goes down. The stack of books up for review are just growing and growing. They grew as the snow fell. Image that .. right? I mean what should you do when you can't get out of your driveway when the private road you live on is nothing but solid ice. In my case, I do what I normally do. That means I sew, stitch and/or read in any given day. Sometimes I combine that with doctor appointments. Of course for me that means a 45 minute ride to the big city for what ever the appointment that it is. From there it's me walking in, letting the receptionist know that I'm there. Then the nurse will call me back to get vitals, place in a room to wait for the doctor to come in. Get my prescriptions, drop them off, more waiting then a 45 minute ride home. Image how much I can get done during all that time? Most the time I take my e-reader with me. What does this mean I wondered. After looking at the listings, I discovered that my reviews are being featured in the listed reviews on NetGallery for the following books. For Jane Porter's "The Kidnapped Christmas Bride" and Peter Kaufman's "Skull In the Ashes". It might not mean much to others, seeing how I wouldn't receive royalties of any kind. But to me, it was kind of nice to have someone acknowledged all the reviews I do with them. I guess it's of a pat-on-the-back kind of thing that gives me a warm fuzzy feeling inside. With all the books I've read lately I thought I would continue to mix the different types to include some quilt themed ones as well. 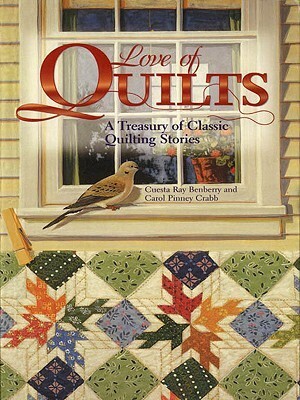 This week I offer up "Love of Quilts: A Treasury of Classic Quilting Stories" by Cuesta Ray Benberr and Carol Pinney Crabb. from Voyageur Press. There are more than 20 million quilters in the United States, and 78 percent of dedicated quilters read for pleasure. To reach this vast group, we've expanded our line of quilting books by bringing back "A Patchwork of Pieces, previously published in 1993. "Love of Quilts features twenty-eight entertaining short stories about quilts and quilters collected from the pages of classic magazines such as "Godey's Lady's Book, Harper's Bazaar, and "Good Housekeeping, introducing readers to the captivating worlds of quilters in other times and places. From courtings that nearly go astray to husbands and wives brought together by quilts to quilters obsessed with securing scraps, "Love of Quilts has something for every quilter. Fascinating fiction, these stories also provide important social history. This book also includes a bibliography of quilt fiction and a time line that lists American quilt fiction, plays, poems, and patterns published from 1845 to 1940. This was an interesting read that was gifted to me and will be a permanent member of my collection that I will read over and over. This is a collection of short stories that lend themselves perfectly to times of waiting, or even just before drifting off to sleep. It is difficult to decide which one is my favorite. It would be like asking me which of my children is my favorite. Quilts can cross so many spans of life and stations of life. They can give us a piece of history that can be pasted down from generations to come. We can feel them, pet them and dream of the relations that we have not meet before. The historical view point is interesting as you read the different types of quilts and fabrics throughout the book with the historical publishing's for women of the times. We have some that represent the Civil War, some of them have a moral or lesson with in the story, there are some that are told from the different stations with in a household. Think "Downton Abbey" and I love the timeline of events in the back of the book as well. Now some might have trouble with some of the dialect used in some of the stories, but I found that it lent it's self more to the time line in which the story happened. The stories are various in their telling, and subjects as there are quilt patterns, but they always have a quilt in them to bring the collection together. The different stories will invoke a wide range of emotions. You can connect with the writers and the stories. I enjoyed the book very much, so yes I would recommend it others like my local library; so that more local quilters can share in the joy of the book. I will give this 5 out of 5 stars. How do you kill a man who's already dead? Detective Evan White is on the trail of a killer. A madman who slaughters at a whim. A murderer bent on destroying everything and everyone Evan loves. An assassin who can't be killed... because he's already dead. ... and what crimes are merely seen. OMG!!! This was a gripping thriller that I would compare to a love child of a couple of my favorite movies ever - "The Fugitive" with "Secret Window" and a small touch of "Sixth Sense" tossed into the mix to making interesting. There is no doubt that this book will stay with me a long time. Evan White is a cop dealing with the horrid death of his cheating wife soon after making the startling discovery in their martial bed. He is bound & determined to find the killer in the cold case. His partner - Angela is tough, sassy, dealing with the demons of her past after watching her father being torn apart drug crazed fiend as a child. She is small & petite but is a box of dynamite when the occasion arises. Oh and she is in love with her partner!! But she isn't the only strong female character in the book. Nope there is Tuyen. She is a young lady caught in the battle of modern and traditional Vietnamese life. We meet her in the bar with her rainbow hair, piercings, attitude and a gift of being psychic. She works in a Vietnamese voodoo shop and has had a rough life. We watch as scenes unfold to take us to a gun blazing bar fight, an Vietnamese Mystic/Voodoo/Religious shop, to the dark and dreary spaces in a the police department building, to church to dark alleys. It's wicked fast-paced and a page turner that had me reading my e-reader long into the night. The plot was terrifying ellecent and I read this in about 8 hours over the course of two nights before bed. This was my introduction to Mr. Collins and I'm fascinated to the core!! Look out Stephen King, Dean Koontz - Michaelbrent Collings has arrived! The ending is well ... unexpected. Yes - unexpected is a great word for it! But I'll give no clues before it's time. Go - RUN!! For your own copy, you'll be glad that you did. This scare has earned a solid 4.5 out 5 stars and has me heading for the library for more by this author. I won this book from the author on booklikes.com. I'm offering up my humble review on the book without any influence from anyone associated with the book. Please take it with a grain of salt and then read it and form your own.